Not to brag, but I'm making some awesome progress on my TBR pile so far this year. Not only am I reading books that I own, but I'm reading books that I've owned for a long time! One of these books is Dorothy Dunnett's King Hereafter, which I was finally motivated to pick up when Sharon at Library Hungry promised to read it with me. King Hereafter is about Thorfinn, better known to history as Macbeth, and his rise from an awkward boy trying to defend his small plot of land to a respected king of a vast swath of land. And at his side is his beautiful, brilliant wife Groa, who helps his come fully into his own. King Hereafter is a very long book, so we've broken up our discussion into the books four parts. Below is the second half of our discussion on Part 1. For the first half, please visit Sharon's blog at Library Hungry. Enjoy! Aarti: Oh, I completely agree! I think I have a general gist of what’s going on (i.e., Thorfinn is defending his turf and possibly seeking to expand it), but THAT IS ALL. I don’t get all the political intricacies between the countries and I don’t understand how the church really fits into it. I find that I don’t really mind, though. I mean, I wish I understood more, as I assume I would get even more out of the novel if I did, but I am quite enjoying the ride as it is. I’m glad to know that I’m not the only one who is confused, though! Bringing up the names Thor and Finn does remind me of one of my favorite aspects of this book - the play between the Norse religions and Christianity. I didn’t realize that Christianity was still so new up north in the 11th century, and the way that Thorfinn walks that line, and the way everyone interprets his actions. What did you think? The other thing about the dense plotting is the almost unbelievable amount of research Dunnatt must have done. I mean, not every character is historically real, but the places, names, descriptions, boats--knowing that she must understand and follow all this in my head leaves me in awe. You know what it reminds me of? Reading a long, well-written article about something I know nothing about--ballet, for example, or microbiology. I don’t know the names, and half of everything has to spelled out for me and the other half I don’t get, but the amount I follow is fascinating, and it makes me aware of the depth of the story in Dunnatt’s head, or for someone who did follow all the little details. I completely agree about the religion; that’s one of my favorite elements here. And I love the practicality that lends to things--how a number of people who knew Olaf went off Christianity when he was canonized, and one place where Skeggi is talking about the precautions he’s taken by confessing and sacrificing, etc. It’s interesting that religion completely takes a backseat to the politics--there’s very little actual thought about God and a lot more concern about the land the church controls, who holds the positions of power, etc. The church is really another fiefdom. Aarti: Yes, it’s such a pragmatic move to become Christian. From what I heard on a Stuff You Missed in History podcast, the Church at this time really was very political and the Papal office was often filled through bribery or family connections. So I can see the decision being made due to political reasons rather than any great converse with God. I think Part 1 ends on a very interesting note, with Thorfinn off to become a much more important person, politically, than he was before. It will be fun to see what happens next! I’m well into section two now, so all my thoughts are really moving on to this section. I have things to say, too, but I’m not quite to the end yet. There’s so much going on, though; this is the meaty part that doesn’t really touch on anything in the Shakespeare, so I get to enjoy it out from under the shadow of the Bard. Can’t wait to talk about this section! Your discussion so far makes this book sound really interesting especially about Christianity. I really need to start reading those books that I've owned for a really long time. Sometimes it surprises me how long unread books have been on my shelves. Kudos to you for doing it! I see that this is a rather complex read with a lot going on just under the surface, and I love that you two are examining character motives and religious motives to find out more about the story. I can't wait to see what happens in the next installment! I can't wait to read this book but after reading all of the Lymond and Niccolo books last year I decided to take a break from Dunnett for a while before starting this one. It does sound fascinating and I'm glad you're enjoying it. How does Thorfinn compare to Lymond and Nicholas? I've only read the first Lymond book and that was soon after my son was born so I remember it being very long, I couldn't keep up with all the characters etc! 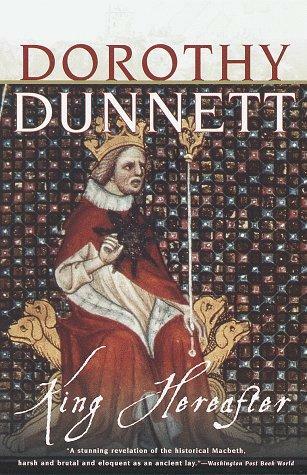 I'm interested in religion during that time, maybe I'll have the courage to try Dunnett again. Congrats on tackling so many books you own -- that's awesome!! I'm curious about this one -- reading Sigrid Undset's Kristin Lavransdatter trilogy -- which shows how new Christianity was in, whatever, 1100 or thereabouts, was very revealing!